Welcome back to another challenge with Kraftin Kimmie Stamps! This week our theme is MOVIE INSPIRED! Use any one of our stamps to tie into any movie or tv show for your creation! How fun is that?? Create a card, scrapbook page, altered item etc. with a movie/tv theme and submit your design for your chance to WIN! You have until Friday, February 9th to enter this challenge! Keep in mind, all entries are welcome but you must use a Kraftin’ Kimmie Stamp in order to win. Each Saturday we post a new challenge and you can enter as many times as you like!!! And each submission during the month will enter you into the monthly prize which will be…. a $40 gift voucher to spend in the krafty shop!!! What do you think? Worth playin’ for? My movie inspiration for this week might date me a little haha. This was one of my all-time favorite movies growing up. Take a look at my card and see if you can guess it before I fill you in on the answer below. For the process of my card, I stamped my image onto Neenah White cardstock using Memento Tuxedo Black Ink. Then colored with my copic makers and cut out with my Scan n Cut. For my background, I used Salty Ocean, Blueprint Sketch, Chipped Sapphire and Black Soot Distress Ink. I also added a little bit of clouds to the background with a cloud stencil and the Black Soot Distress ink. To create the starry background, I mixed perfect pearls with some water and flicked it onto my card. I did the same thing with white paint and water. So…. any guesses…? It’s the Never-Ending Story! 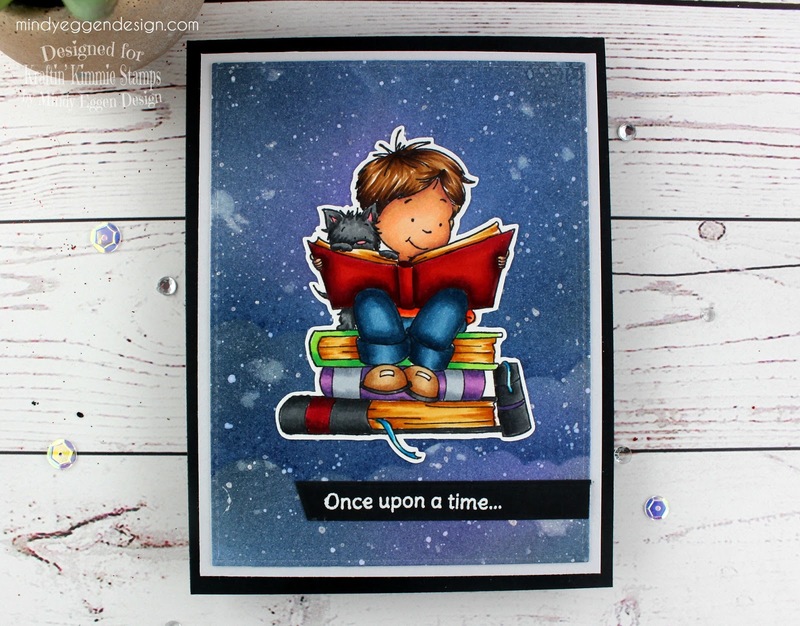 A boy reading from a big book with this dreamy background seemed to match perfectly. I hope you give this challenge a try! It’s a lot of fun! 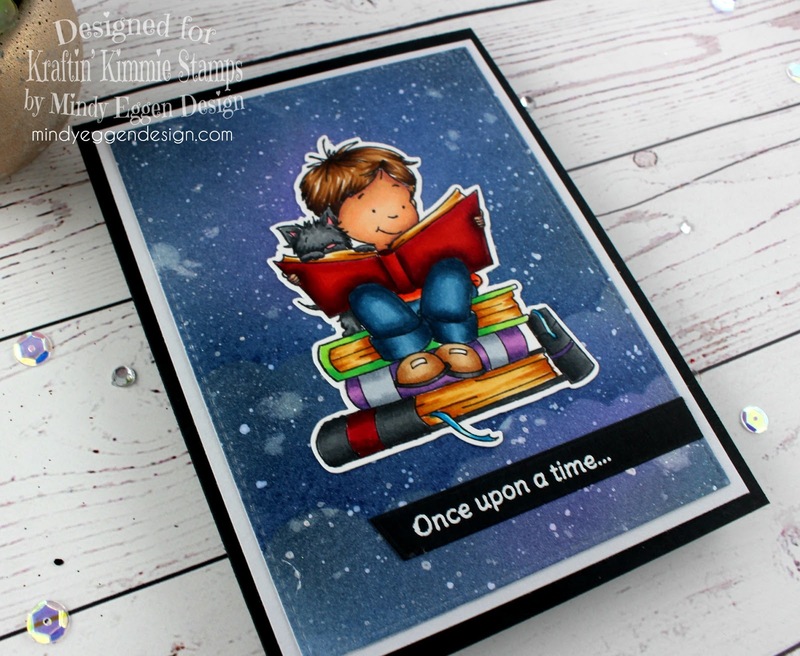 Also – you don’t want to miss all the fun going on over at Kraftin Kimmie Stamps this weekend!! 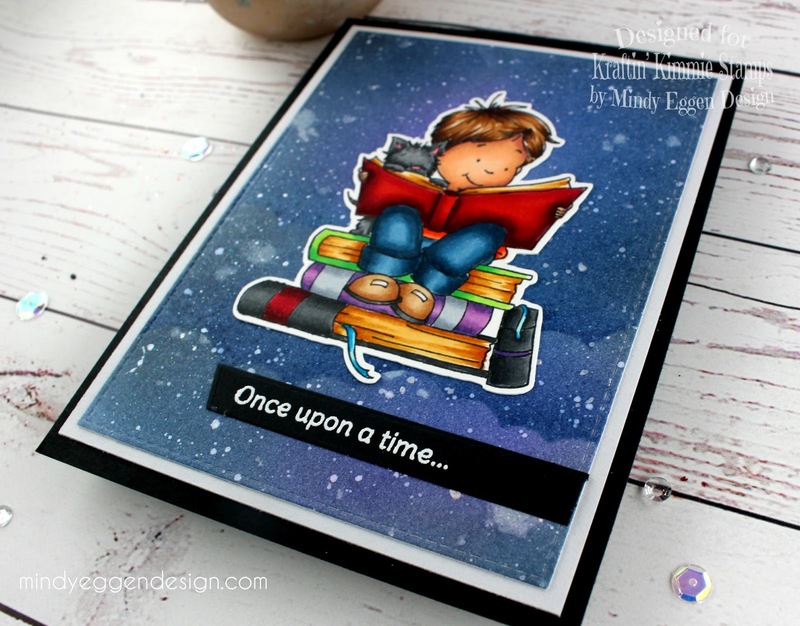 Be sure to hop on over to the Krafty Shop this weekend because our FRUGAL FRIDAY SPECIALS are up with FOUR of our amazing stamp sets on 40% OFF! Plus we’ve got a bunch of fabby sets back in stock! AND we’ve opened the KRAFTY VAULT and brought back a totally RAD guy stamp set, called SMELLS LIKE TEEN SPIRIT in red rubbah for a limited time! OH! And did we mention??? It’s Kimmie’s Birthday this weekend soooooo how about some extras??!! A GIFT FOR YOU!!! Spend $50 and you’ll receive a FREE stamp set!! Spend $100 and you’ll receive TWO FREE stamp sets PLUS FREE SHIPPING!!! Woohoo!! How about THAT?! To Pieces!! Pink & Main Sneak Peek! Preview Day 1 – C. C. Designs! Wauw ! Beautiful card !